Aphid control is, usually, not a worry inside your home but in your garden, if left uncontrolled, and if more than a moderate amount of aphids abound in your garden you'll notice the leaves in your garden will start turning yellow and/or curl, leaving the plant weaker as it tries to defend itself. While at times aphids can be brown, black or pink, most of the time they will be GREEN in color. They are distinguished from other green critters by the tube-looking nodes which can be seen from the rear of their abdomen and real long antennae. Aphids are most prominent during spring and fall but their lifespan is short, which means that they can reproduce quickly leaving you with an infestation before you know it. 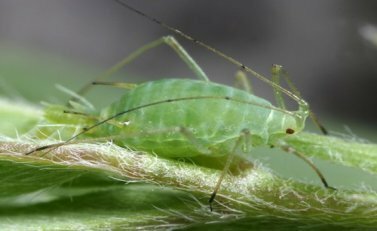 The first hatching occurs in the spring when the stem mother gives birth to females who readily start giving birth (asexually) to more female aphids themselves. However, by the end of fall they give birth to winged males and females whose only job will consist of mating, dispersing eggs, and dying shortly after. 1. Trimming and thinning out your garden (including trees) will quickly expose aphids forcing them out into the open where other hungry bugs will spot them and take care of them for you. Don't forget to prune infested areas. 2. You should also plant a few wildflowers along with other weedy species along the edges of the garden, this will attract enough aphid eaters. 4. Get a hold of a water hose or spray bottle and simply wash them off leaves and other growing tips. Using soapy water will give you better results but plain water will work fine. Here's a quick list of bugs (their natural predators) that will most certainly take care of aphids. Simply find a few of these and place them in your garden. Here is where most people have the worst time. But if you READ THIS WARNING you won't have the same problem. We don't recommend using chemicals on aphids because what will end up happening is the extermination of other "good" bugs, mostly their natural predators.